As-Salam Alaykum and hey Sister Zeynab ...... after a long time me gonna make pakoras at home, InshAllah tomorrow ..... pakoras with potatoes, onions and fresh coriander. Yeah of course I know the procedure. Just wanna check with you on the perfect seasoning and the measures. Walaikum As-Salaam and hi Sis. 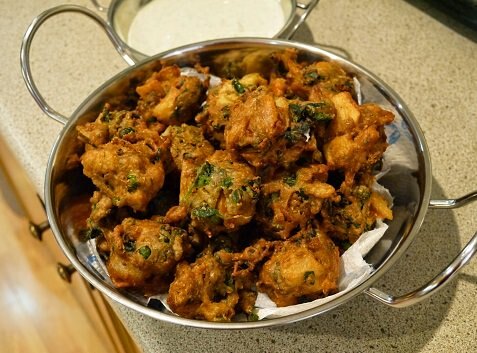 Potato, fresh coriander and onion pakoras are the best of all pakora fillings. Made them recently and shared with a sister neighbor. Seasonings for the chickpea flour (besan) are pretty much standard. For example, with 1 cup chickpea flour try the following seasoning to prepare a nice batter. Half tsp coriander powder, 1 tsp salt, half tsp turmeric, half or less tsp chilli powder and half tsp all spice or garam masala. I made with 2 cups of chickpea flour and accordingly doubled the measurements. With 2 cups chickpea flour, I would suggest about 3 tbsp fresh coriander leaves chopped, 2 potatoes sliced into rounds and boiled and 1 large onion roughly chopped. Mix all of this with the batter which should be more or less the same consistency as cake batter. Deep fry in heated oil (I use Mazola corn oil) until golden brown. Make sure you use enough oil so the batter drops can float, otherwise they won't fry well. The ones I made looked somewhat like these, though some turned out a bit flatter as I don't have a wok (or karhai) so I used my ceramic frying pan. A big thanko meo Sis! This is precisely what I wanted to confirm. Btw, what sauces or dips do you think would be best, tomato ketchup, coriander (dhania) chutney or whipped yogurt raita as seen in the image? I like it best with dhania chutney but my chutneys aren't the best. Wanna bother you a bit more on that. 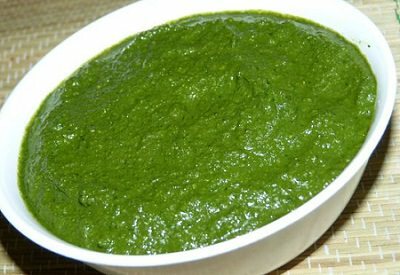 If you've made dhania chutney any time in the past, what were the seasonings .. just putting dhania leaves in the blender to make a paste tastes bitter?! Coriander leaves (removed from the stems), garlic & ginger pieces or if you already have garlic & ginger paste .. use a little of that, salt, some sugar, a little lemon juice, cumin powder and some water. Put all of this in a blender to make a smooth paste. Instead of lemon juice, some folks also use tamarind or imly water. That too is good but again involves a little extra work of soaking the tamarind in water for a while. Also, if you like it spicy, you can add a couple of chopped green chillies with all the blender stuff. Tons a thankx my dear Sis! Aw! how sweet dear Sis InshAllah ..... InshAllah.